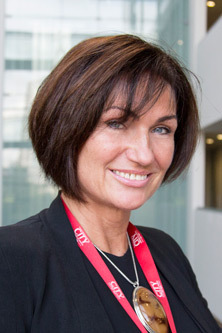 Claire Priestley is Director of Information Technology. She joined City in 2008 and has held roles as Director of Academic and Professional Process Change & Systems, Director of Application Management and Director of IT Business Management. She recently won Future CIO of the Year at an event celebrating the IT industry’s highest achieving women. What does the role of Director of Information Technology entail day-to-day? Every day involves meetings – largely face-to-face although increasingly it’s becoming a mix of videoconferencing (Skype) and teleconferencing as well as the usual in-person meetings. Many people question the validity of meetings but I still believe that – run well – they are the best way of getting things done. Being able to interact with people both within the team and across the University is critical to running a great service. On many levels my role is similar to the Director of any other service. It’s about recruiting, developing and retaining highly talented and committed people, and trying to create the environment in which they can flourish whilst enabling our Students and City to achieve our Vision. More broadly my job is also about balancing the tensions between what we need to do operationally to deliver great service today, and what we need to be developing and innovating to deliver great service in the future. My first-ever job was a paper-round at the tender age of 10 years old! Do people even know what that is these days? I went on to have a series of part-time Saturday jobs whilst still at school, before working in an office as a business administrator. I moved to London in the end because I couldn’t see any career options beyond those of nursing, teaching or being a secretary. Not that those aren’t entirely valid and worthwhile careers – they just weren’t for me. Only 17% of IT professionals in the UK are women. Why do you think that is? This is a complex question and any simple answer does a disservice to the subject, but to take one aspect - I think there is a lack of publicity around the achievements of women not only in technology but in all STEM subjects. We need to celebrate our foremothers and leading female pioneers in IT the same way as we do Steve Jobs and Tim Berners-Lee for example. Do people know of Hedy Lamarr’s contribution to wireless and spread-spectrum technology? I doubt it – but we may be familiar with her screen images from the 1920’s. We have a wealth of women whose contributions and successes we can celebrate - Ada Lovelace, Grace Hopper, Mary Lou Jepson, Stephanie ‘Steve’ Shirley, Joan Clark…. I could go on. My point is these are not household names and we need to make them so. Is anything being done to address the issue? Absolutely! There are some fabulous initiatives at the moment aimed at empowering girls from a very young age (check out the book range “A Mighty Girl”). I have seen significant increases in attempts to improve diversity in technology both globally and at a local level. Even within IT at City we are working on a number of activities to increase diversity not only in the immediate term but also through outreach work with schools and other community organisations to affect a longer term impact. I’m also about to launch a programme called CIO plus1, designed with just this in mind – so watch this space! Oh – everyone that knows me could answer this - I box. There’s nothing like an upcoming fight to focus one’s training and keep you motivated to go for that run on a cold dark morning.